4D micro-CT (Micro-Computed Tomography or 3D X-ray imaging) involves imaging dynamic processes over time. This article explains step-by-step time-lapse and real-time methods, and how they can be used in geology and geoscience to image processes in rocks. These methods can also be used in other areas; If you have any questions just get in touch. Author: This article is from Micro-CT Academy, a monthly newsletter from Bruker about micro-CT news, methods and applications, by the Bruker Micro-CT applications team: Applications.BmCT@bruker.com. You can read previous articles and subscribe to the newsletter on the Bruker website. Time-lapse imaging where dynamic processes are imaged in steps, with no movement during the scan. Real-time imaging involving fast, continuous scanning. This is more suitable for processes that happen quickly. The Bruker SkyScan 1275 is ideal for fast, real-time continuous imaging. As micro-CT technology develops, 4D imaging methods are now being used in geology and geoscience. They are particularly useful for imaging the movement of fluids and the crystallisation of solids in pore spaces, for example in oil and gas recovery, and natural stone weathering. Time-lapse CT is used to scan slow processes at intermediary steps. Scans can be taken once a day or after each cycle of treatment. With this method, image quality is often more important than acquisition speed, so most micro-CT systems are suitable. 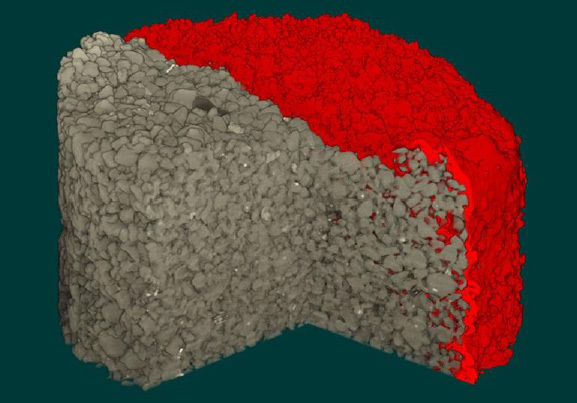 Time-lapse imaging: Volume render of a Bentheim sandstone sample with salt crust visualised over half the sample. Cross-section of the same rock, showing the evolution of the salt crust with 4 cycles of saturation with salt liquid and drying at atmospheric conditions. Imaging dynamic processes in real-time requires shorter acquisition times, as samples are not stable during the scan. When the sample is moving and continually changing phases, the scan time needs to be as short as possible to minimise movement artefacts in the image reconstruction. With real-time imaging, speed is the priority in order to acquire the most useful images. The SkyScan 1275 is ideal for real-time imaging; it can perform scans in 1-3 minutes, with sufficient image quality for quantitative analysis. To minimise errors, it is important that CT images are scanned and reconstructed under constant conditions. Bruker’s DataViewer software includes image registration features, so you can compare data pore-to-pore or grain-to-grain. Images and movies can be created to present your work, along with quantitative analysis of all datasets, to reveal information about how your sample changes over time. 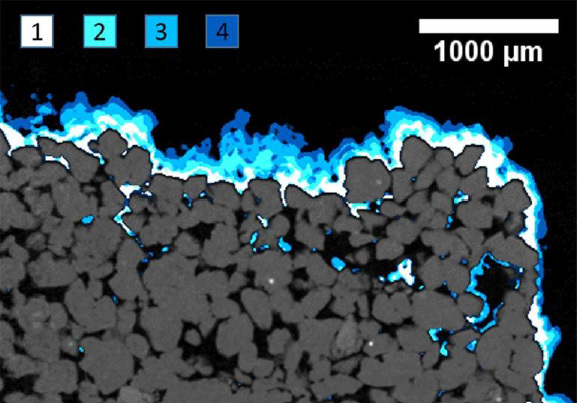 Real-time imaging: These cross-sections show the changing fluid content of pores over 30 minutes. 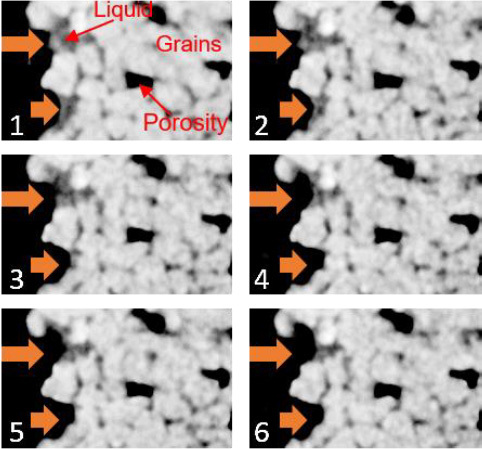 The orange arrows indicate where fluids are moving through the material. Source: This article is from Micro-CT Academy, a monthly newsletter from Bruker about micro-CT news, methods and applications, by the Bruker Micro-CT applications team: Applications.BmCT@bruker.com. You can read previous articles and subscribe to the newsletter on the Bruker website. Method notes written by Bruker are available, with a walk-through of the entire process of imaging and analysing 4D CT scans, including acquisition, reconstruction and 3D analysis, for both time-lapse and real-time 4D imaging. If you’d like a copy, please get in touch. Blue Scientific is the official distributor of Bruker Micro-CT in the UK, and we are available to answer all your questions. We supply the entire range of scanners from Bruker, and are happy to advise on which would be most suitable for your application.